One swift scroll through the Instagram feed of Natasha Bacchus-Saunders, bka Naturally Tash, and you won’t protest her profile description, which reads “Queen of Temp Hair Colors”. Emoji crowns included! Today, her bouncy ‘fro is a ‘Royal Navy’ blue. Before that, the 38-year old hair colorist and owner of the I Rock My Natural blog was running errands through Houston sporting a mix of lavender and burgundy curls with Vans to match. 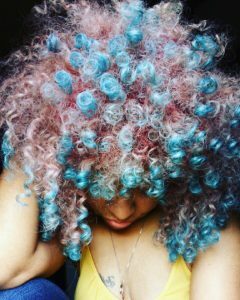 Almost 80,000 followers flock to her page not only to see what hair color she’ll slay for the weekend, but also to learn exactly how she manages to change it so often without experiencing major breakage. One of the keys to Tash’s tresses is hair shadowing—a technique many credit her for popularizing, which uses eye shadow to temporarily dye the hair. Yes. Tash takes eye shadow (even the $1 Wet n’ Wild shadow color ‘Suede’ for her ‘Blue Razzberry’ look). The shadow washes out the moment you take it to the water without changing your curl pattern or ruining your ends. (She also stresses that naturals with a tighter, kinkier curl pattern can also hair shadow—though we may not hold our color as long since we often must moisturize more frequently). When it comes to her temp method, Tash has one concern: Getting stuck in the rain. 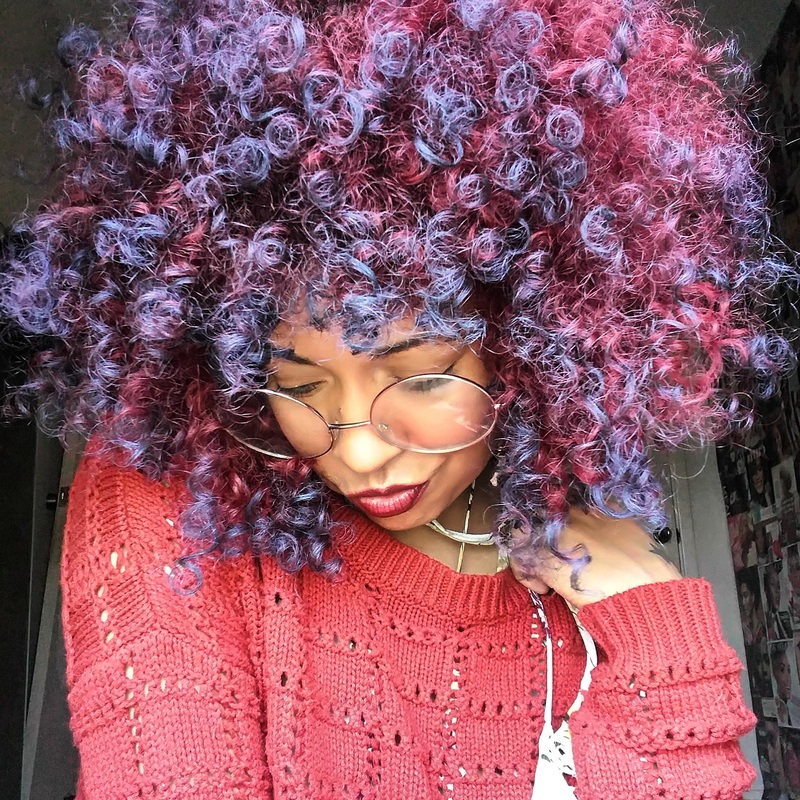 Tash began exploring temporary coloring options about four years ago after a rocky relationship with box dyes and a flat iron left her curl pattern in bad shape. “I always liked dyeing my hair but back then I didn’t know a healthy method,” she explains. 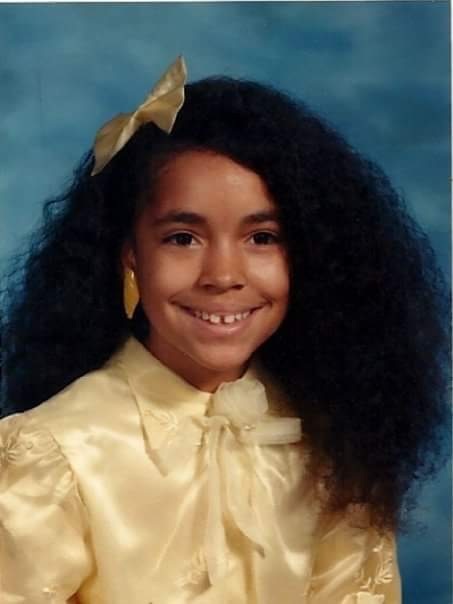 S­he begged her mom for a perm and though reluctant, she finally agreed to let Tash tame her mane. And though many folks frown upon colors (and be real: natural hair, period) in the workplace, Tash switches up her dying routine for no one and no reason outside of growing tired of one hue and ready for another. “I’m blessed to be in a workplace that allows me to be me and focuses more on what I do for the kids,” she says. Her co-workers are so used to her adventurous hair endeavors that they barely notice when she makes changes anymore. But the kids do. Tash even hosted a coloring party for her class of 32 students—with permission from the parents, of course. Tash loves children deeply and has taught for over 10 years but transitioning from teaching to cosmetology in 2017 is her next move. She plans to open the first temporary hair coloring studio in Houston and start a product line complete with hair shadows and deep conditioner (she mixes color in her conditioner to make the dye last younger). But just wait on it. Her shop will come by popular demand since social followers and fellow Houstonians already reach out often for the magic touch from Tash. “My fans are true blue,” she says. Just like her hair. And only one of these things will be changing anytime soon.